I bought a Grainfather to let me continue to brew in the very hot summers here in Texas. Below are pictures of the unboxing and the first brewday. First problem, lid was loose. Lugs cast as part of the controller body were sheared off. The pins were caught in the lid. Fortunately found them. The lid doesn’t fit without the pins. Grainfather is shipping out a new controller to swap out. False bottom installed with the telescopic pipe and the capped insert. The bar is used to lift the insert. Controller. Pump Switch. Mash/Off/Boil element switch and STC. US model is in Fahrenheit. Pump. Concerned here with the pipes going into the silicon flanges. No leaks yet. False top that lays onto the mash. Note the silicon gasket that is a bit of trouble. New model ships with a capped pipe that slips into the center pipe during grain in – keeps out the grains. Grain in yields a thicker mash than I am used to – there is a good deal of water below the mash bed, so work to reduce dough balls. Once the overflow device locks the false top in place, then the RIMS tube is set and flow controlled to just fill to the overflow. The RIMS tube sits through an opening in the glass lid. The flow is set too high, allowing too much wort overflow. Dialed it back a bit. Temperatures fluctuated a bit, but only by a degree. This was maintained by the 600W element. After mashing, the insert is lifted. This was quite heavy, and I needed to use a step ladder to get high enough. If this was on the floor – not an issue. I am 6′ 4″. I needed this. My wife found it hilarious. Still useful for manual sparging. Chiller sits on the top. I circulated the chilled wort back into the urn to drop the temp further. With the recirculation, the wort became very clear. Clear wort coming out of the pump into the chiller. Lovely wort and color. Hit OG perfectly. Pump filter became completely saturated with hops. Will use a bag in the future. Used the spoon to scrape away hops from the filter. 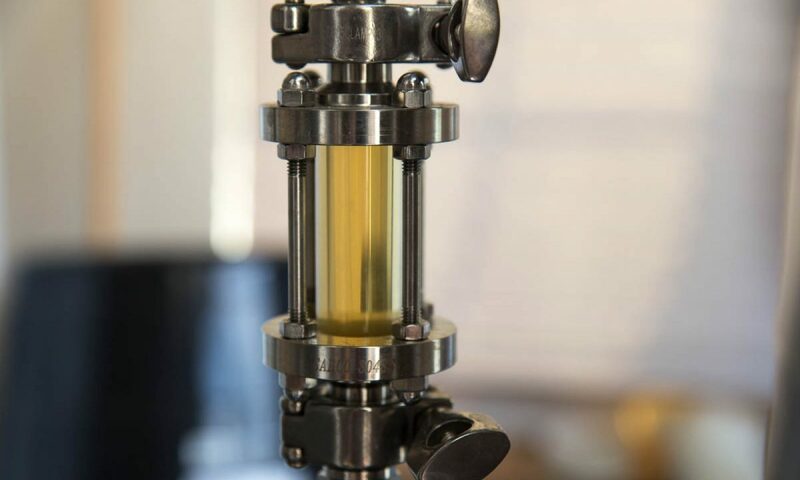 Filter drew all the trub and hops to it – however – created a nice filter for clear wort. Just over 6 gallons into the fermenter. Tipping up the GF to cover the filter. So after spraying clean, some sticky trub was beginning to burn onto the bottom. It wiped away with ease however. There have been some concerns about the boil strength. So while this took a bit longer to come up to boil (which I can shorten by starting to heat up during sparge, I am pretty happy with the boil strength. Took a very short video – below. First brewday – learning things – still hit target volumes and gravity! Cheers!